Heading down on the final descent to the Mediterranean the weather is a real disappointment. Instead of the blue sky, sun and sea it's all cloud, rain and greyness. It's a shame and adds to the stew of mixed emotions inevitable at the end of a 37 day trip. To be honest the weather forecast was so bad last night that I didn't think it we'd be walking at all today. Finding that all we had to contend with this morning was cloud and mist was a pleasant surprise. Adding to the initial sense of good mood as we left Oix was the hotel bill, amazing value for such a lovely place. 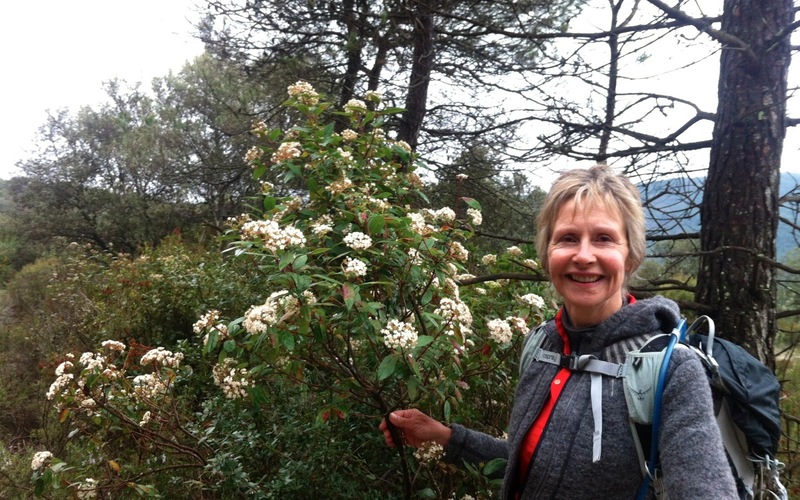 The first couple of hours walking took us up over mixed wooded upland countryside. The virburnum was in full flower and combined with mushroomy smells of rotting leaves made for lovely smells. The way marking was poor and the signs confusing but eventually we found ourselves heading down into arable countryside and towards Tortellà. Before the final approach you have to cross a little gorge spanned by a stunning stone bridge, the shape of which seems to a feature of the bridges around here. 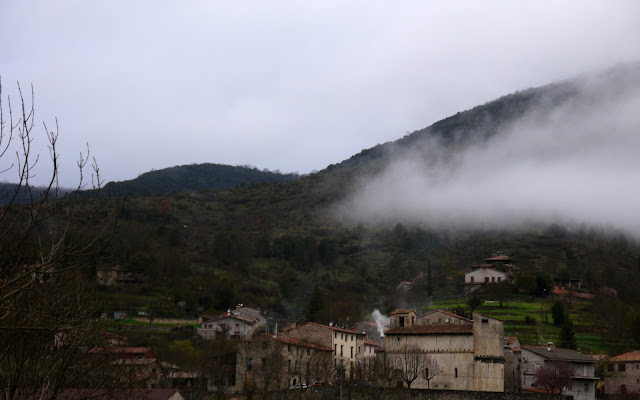 It was about 12 when we stopped for a coffee in Tortellà and our luck with the weather started to run out although it was drizzling rather than raining. 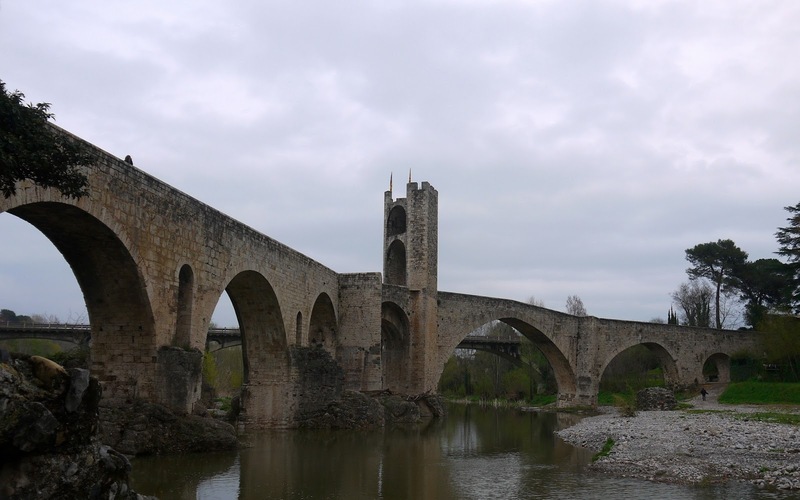 The route between Tortellà and Besalú was not nice, the way marking dreadful and we missed the trail, there was a horrible bit of motorway to navigate, and at one point we found ourselves crossing a muddy field in pouring rain. When we arrived at Besalú we decided that enough was enough and a taxi to Banyoles was going to be the next step. Besalú however was wonderful, a medieval town packed with Romanesque buildings. The Count of Besalú was Wilfred the Hairy and he is accredited with the unification of Catalonia which may explain the huge number of Catalan flags which adorned the town. 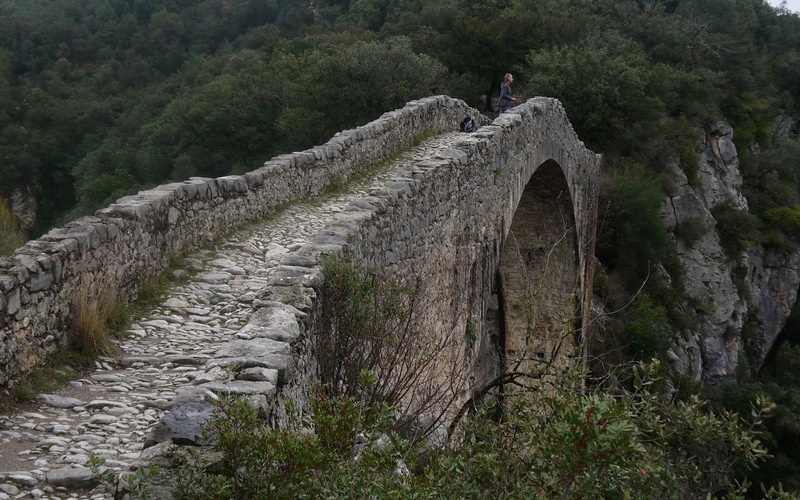 Perhaps the most memorable feature was a 12th Century bridge was spans the river to the east, There is a gate at the town end and a gate in the middle of the bridge. 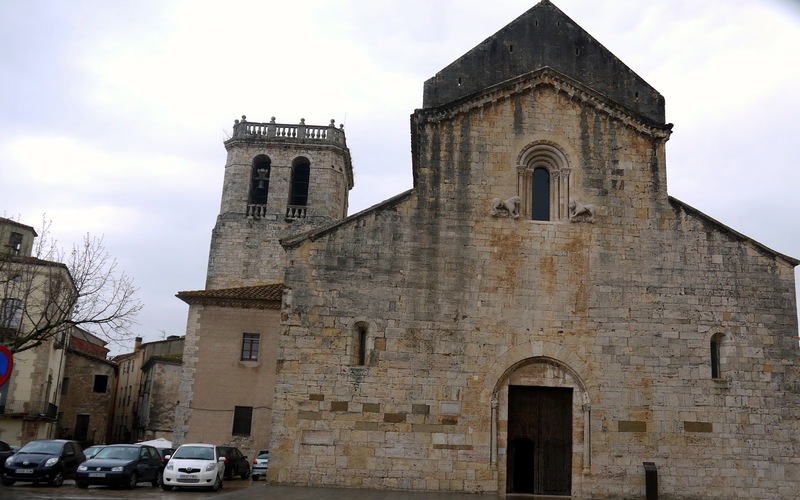 Having decided we were going to finish at Besalú we stopped for lunch in a restaurant in the main square which features the 11th Century church of Sant Pere. Having eaten the good but overpriced food we struggled to get a taxi and, partly to compensate for being ripped off in the restaurant, decided to walk to Serinyà. The rain held off for the 90 minutes it took us to complete the trip, and when the bus turned up on time and only charged 1.5 euros to get to Banyoles we felt that we had definitely done the right thing. Banyoles is to the south of the GR1 and we will be getting a taxi to rejoin the route. Will have a look at the weather in the morning to decide how much we do.